John James Audubon (April 26, 1785 – January 27, 1851) was a French-American ornithologist, naturalist, hunter, and painter. He painted, catalogued, and described the birds of North America in a form far superior to what had gone before. Born in Haiti and raised in France as a youth, in his embrace of America, and his outsize personality and achievements, he represented the new American people of the United States. 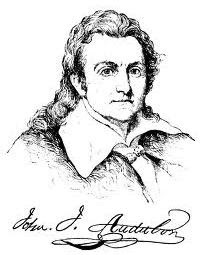 AUDUBON, John James, naturalist, born near New Orleans, La., 4 May, 1780; died near New York city, 27 Jan., 1851. His grandfather was a fisherman of La Vendee, in France, and his father, who had worked his way up to the command of a French man-of-war, and had acquired a plantation in Louisiana, married there a lady of Spanish descent, named Anne Moynette. 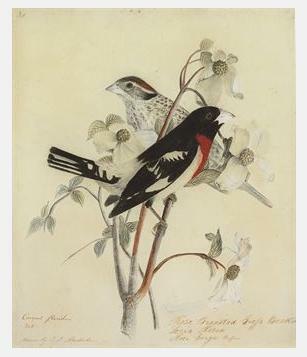 When very young, Audubon lived for a short time on a plantation belonging to his father in Santo Domingo, and, after his mother's death in a African American insurrection, was taken to France to be educated. His parents had encouraged in him a love of nature almost before he was able to walk, and he had long amused himself by trying to transfer to paper the graceful forms of the tropical birds with which he was familiar. Although his efforts fell so far short of his ideal that he was accustomed to make a bonfire of them on each birthday, they nevertheless showed talent, and his father placed him in the studio of the celebrated painter David. Here he was set to drawing horses' heads and the limbs of giants, instead of his favorite birds. He persevered, however, in this one study, while he neglected all the others, preferring to spend his time in excursions through the woods, gathering specimens and making drawings of birds. Seeing his tastes, his father, who had designed him for the navy, gave up his plan, and sent the boy, then seventeen years old, to a farm belonging to him at Mill Grove, near Philadelphia. Here young Audubon spent his time in hunting, fishing, drawing, and collecting specimens of natural history. A visit to France, made to lay before his father some grievances against the agent who had charge of the property, enabled Audubon to add largely to his collections. His house at Mill Grove became a museum, filled with stuffed animals, and decorated with festoons of birds' eggs, and with drawings of birds and beasts. He became an excellent marksman, and was also at this time quite a dandy, if we may credit his own account. While at Mill Grove he fell in love with Lucy Bakewell, daughter of an Englishman who had come to America a few years before, and whose property adjoined that of Audubon. At the desire of Mr. Bakewell, who thought him somewhat unpractical, he entered the employ of a firm in New York, where he soon demonstrated his lack of interest in anything but natural history, collecting specimens with his usual earnestness, and letting business take care of itself. It is related that his neighbors at one time made a legal complaint against him on account of the disagreeable odor from the drying bird skins in his room. He soon returned to his home, and, thinking he might be more successful in the west, formed a partnership with Ferdinand Rosier, a friend, and, having sold his farm, started, in 1808, for Louisville, Ky., with a stock of goods bought with the proceeds. Before setting out he married Miss Bakewell, and the journey to Louisville, part of which was made in a flatboat, was their bridal tour. In Louisville, Audubon left business to Rosier, and spent his time in the more congenial occupation of tramping the woods in search of birds and in drawing pictures of them. In his store at Louisville he met Alexander Wilson, the celebrated ornithologist, who had come to solicit Audubon's subscription to his book on American birds, and was naturally astonished when he was shown drawings superior to his own, some of them representing birds he had never seen. Audubon relates that he gave Wilson considerable aid in his search for specimens, but the latter seems to have been somewhat jealous of the rival he had so unexpectedly discovered, and afterward wrote disparagingly of his visit to Louisville. Audubon's business did not prosper, and, after two removals in a vain search for better success, the partnership was dissolved in 1812. Audubon settled with his wife and their son Victor at Hendersonville, where his second son, John, was afterward born. He embarked in a business venture with his brother-in-law at New Orleans, and was again unsuccessful. During this time he was still devoting himself completely to natural history, making long excursions into the surrounding country, sometimes tramping for days through pathless thickets with only dog and gun for companions, and all the time adding new drawings to his collection. Some birds he was obliged to shoot, afterward ingeniously supporting them in natural positions while he painted them; others he drew with the aid of a telescope, representing them amid their natural surroundings. Audubon's appearance was now very different from that of the young proprietor of Mill Grove. After some of his long tramps through tile forests, unshaven and unshorn, his rifle on his shoulder and his color box strapped on his back, he looked the veritable "American woodsman" he was afterward so fond of styling himself. He seems to have done all this with no incentive but the love of nature; the idea of publication had not yet entered his mind. About this time his father died, leaving him an estate in France and the sum of $17,000. The latter was held in trust by a friend in Richmond, Va., who failed shortly afterward, and Audubon received not a penny. His devotion to his favorite pursuit continued to bring him into financial trouble, and he was obliged to earn money by giving drawing lessons and taking crayon portraits in Louisville and Cincinnati. His friends not unnaturally looked on him as a madman, but his wife encouraged and assisted him in every way. To obtain money for the education of her children, she became a governess in New Orleans, whither her husband went in 1820, and where she joined him a year later, and again in Natchez, where they went in 1822. She afterward established a school at Bayou Sara, to help him in the publication of his work, and in this school he aided her, for some time, by teaching music and dancing. The idea of giving his collection of drawings to the world was first suggested to him by Prince Canino, son of Lucien Bonaparte, whom he met in Philadelphia. Audubon had gone to that city in 1824, after earning the necessary money in various ways, on one occasion by painting the interior of a steamboat. About this time two hundred drawings, the labor of years, were destroyed in a single night by rats, and the fact that, after a day or two of natural despondency, he went bravely to work to replace his loss, illustrates Audubon's energy and perseverance. In Philadelphia he met several noted artists, but the idea of publication seems to have had little encouragement. After returning to Bayou Sara, where he had left his wife, he sailed from New Orleans, in 1826, for England, intending to seek aid there, though he had not a friend in the country. On his arrival he began to exhibit his drawings in public, and, though at first he met with discouragements, the value and merit of his work was soon recognized by European naturalists. The friends that he made during this visit included Herschel, Sir Walter Scott, and "Christopher North "in Great Britain, and Cuvier, Humboldt, and St. Hilaire in France. In 1827 he issued the prospectus of his famous work, "The Birds of America," which was published in numbers, each containing five plates. The whole book consisted of four folio volumes of plates, and $1,000 was the price of each copy. The entire cost of the work exceeded $100,000, and, at the time when the prospectus was issued, Audubon had not enough money to pay for the first number. The influence of Sir Thomas Lawrence, the painter, enabled the naturalist to sell several pictures at fair prices, and with the proceeds he paid the engraver's first bill of £60. After this Audubon painted frequently, often supporting himself entirely in this way. He was obliged not only to be his own publisher, but to keep the book constantly before the public by personal solicitation. In 1828 he spent two months in Paris canvassing for subscribers, and in 1829 returned to America for the same purpose; nevertheless, owing to the price of the book, people were slow to give him their names, and many of those who did so did not scruple to withdraw them. In this way he lost fifty subscribers during the preparation of the first volume. But, notwithstanding all drawbacks, the work went steadily forward. The first volume was issued in London in 1830, and the last in 1839. Immediately after the publication of the first volume Audubon began to write his "Ornithological Biographies," consisting of the letterpress to the "Birds," together with reminiscences of personal adventure and descriptions of scenery and character. The work consisted of five octavo volumes (Edinburgh, 1831'9). During this time Audubon continued the collection of material in the United States, and, although sea voyages were misery to him, made several trips to England, where he wrote much of the text or his work. On two of these journeys his wife accompanied him, and she frequently traveled with him while he obtained subscribers. In 1840 he left England for the last time, and thenceforward lived with his two sons and their families at his house on Hudson river. The place, which he named Minnies land, is now within the New York city limits, in what is known as "Audubon Park." From 1840 to 1844 he was occupied with the publication of a smaller edition of his work, which was completed in seven octavo volumes. The classification of the matter in this edition adds to its scientific value. In the folio edition the method of publication of course prevented any attempt at orderly arrangement, and the only effort had been to make the numbers uniform in interest. Before the publication of the last volume of the "Birds." 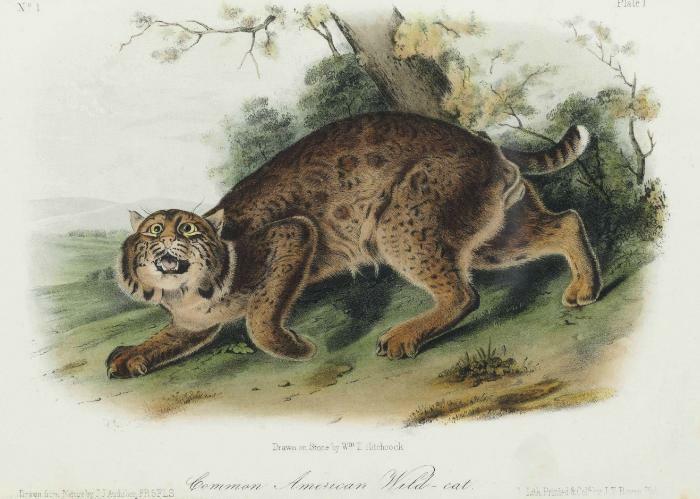 Audubon had projected a similar work on the " Quadrupeds of America," and with the help of his sons, Victor Gifford and John Woodhouse, and of Rev. John Bachman, of Charleston, S. C., had gathered much material. He had planned an extensive trip to the Rocky Mountains in pursuance of his design, bug was persuaded by his friends to give it up, as he was now an old man. His sons did much of the work on the “Quadrupeds of America”. A large number of the animals were secured and painted by John, while nearly all the landscapes are the work of Victor. The first volume was issued in 1846, and the last in 1854, after Audubon's death, under the superintendence of his son John. After he had reached his sixty-seventh year Audubon's mind began to weaken, and during the last four years of his life he was able to do little work. He was buried in Trinity church cemetery, which adjoined his property. His son, John Woodhouse, died 21 Feb., 1862, while preparing a third edition of the " Birds of America." Mrs. Audubon survived her husband many years, and prepared from his diary a biography, which was published in New York in 1868. Mrs. Audubon died at the home of her sister-in-law, in Shelbyville, Ky., 19 June 1874. Audubon was a man of fine personal appearance. He seems to have been attached to his family, and to have been happy in his home, yet he chafed under the confinement of domestic life, and longed to be continually in the woods. After the recognition of his genius, honors were showered upon him. At the time of his death he was a fellow of the Linnaean and zoological societies of London, of the natural history society of Paris, of the Wernerian society of Edinburgh, of the lyceum of natural history of New York, and an honorary member of the society of natural history at Manchester, of tile royal Scottish academy of painting, sculpture, and architecture, and of many other scientific bodies. See, besides works already mentioned, Dunlap's "History of the Rise and Progress of the Arts of Design" (New York, 1834); Griswold's " Prose Writers of America" (Philadelphia, 1847); Mrs. Horace St. John's "Audubon, the Naturalist, in the New World" (New York, 1856) ; Samuel Smiles's "Brief Biographies" (Boston, 1861); and Rev. C. C. Adams's " Journal of the Life and Labors of J. J. Audubon." AUDUBON, John James. 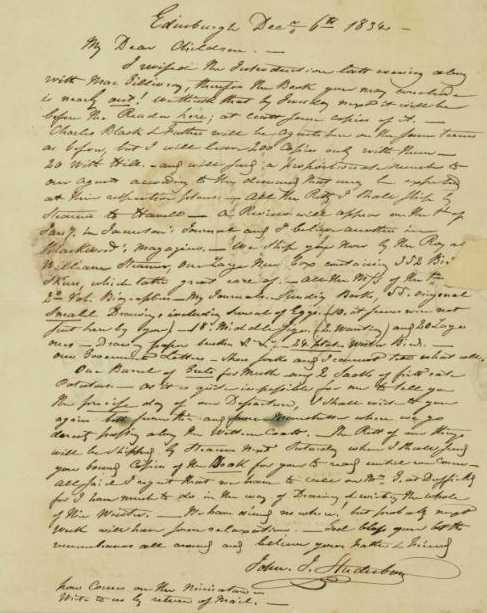 Autograph letter signed John J. Audubon"), to "my dear children," Edinburgh, 6 December 1834. One page, 4to, closely written, neatly backed, otherwise in fine condition. "I HAVE MUCH TO DO IN THE WAY OF DRAWING AND WRITING THE WHOLE OF THIS WINTER..." A typically exuberant Audubon is elated at the publication of a new volume of his Ornithological Biography (vol.2, 1834), descriptive text to accompany the Birds of America: "I revised the introduction last evening with [William] MacGillevray, therefore the book you may conclude is nearly out! We think that by Tuesday next it will be before the readers here; at least some copies of it. Charles Black and father will be agents here on the same terms as before, but I will leave only 200 copies with them, 20 with Hill and will send a proportional number to our agents All the rest I shall ship by steamer to Havell...." He is sending "by the Royal William steamer one new box containing 352 bird skins, which take great care of my journals, sundry books, 55 original small drawings including several of eggs 18 middle size (2 wanting) and 20 large ones [watercolors], drawing paper etc. etc...." The date of his return has not been set, and he regrets that he will not be able to visit a certain Mr. G., but I have much to do in the way of drawing and writing the whole of this winter...."
Audubon had begun his ambitious project in 1826, working with British print makers and ornithologists including the Scottish ornithologist MacGillivray and the father and son engravers, Robert Havell and Robert Havell, Jr. 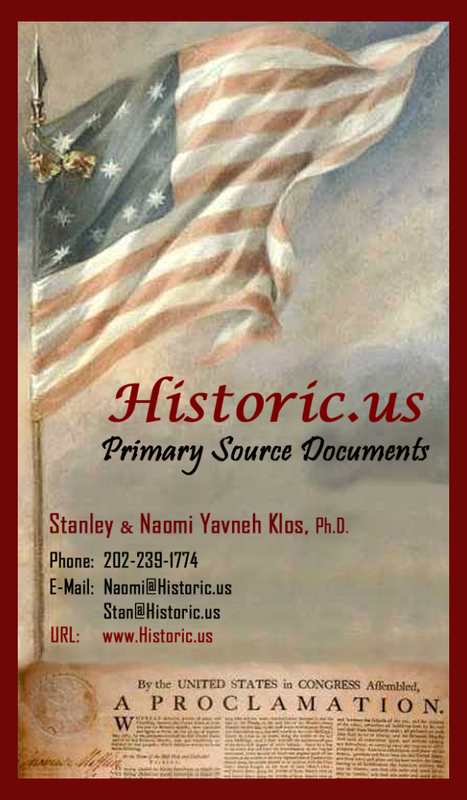 The first part of the monumental Birds of America was issued in 1827; the last completed in 1838. During this period Audubon traveled frequently between England and America, seeking subscribers, searching for new species and overseeing the production of his elephant folio color-plates. At the same time he wrote and edited the accompanying descriptive text, the Ornithological Biography (5 vols., Edinburgh, 1831-1839).